Annapurna Circuit Trek - Blue Mountain Travels and Tours (P.) Ltd.
Annapurna Circuit Trek is one of the most popular classic, diverse and stunning tea house trek in the Himalaya. The incredible views of some of the most stunning 8000 meter peaks including the Annapurna and Dhaulagiri ranges – simply wonderful. We witness the fascinating ethnic groups having their own language and tradition. Walking through the naturally rich terrain of diverse topography trekker has a chance to experience the rich cultural diversity of Hinduism, Buddhism. The mysterious Bon-Po religion still co-exist and intermingle with other at same place. We explore the natural diversity from lush, tropical rice paddies and moss-laden rhododendron forests to Tibetan fortresses clinging to rocky cliffs. We Blue Mountain Travels have specially designed the Annapurna circuit trekking itinerary making it shorter. It avoids the walk on recently build road as long as possible. We start the trek from Bulbule after a drive from Kathmandu. We finish our walk at Jomsom from where we take flight to Pokhara. This trekking route keeps all the main highlights of classic around Annapurna trek intact. The hiking route includes the Great Himalayan trail from Dharapani to Kagbeni, the Tibetan Buddhist dominated settlements. We explore the Braga monastery, the oldest in the region at Manang. The shine of Muktinath, a famous pilgrimage site being worshiped by both Hindu and Buddhist devotees together at Muktinath – another attraction. No doubt climbing over the challenging pass of Thorung la at 5416 meter is tough but rewarding to the great sense of achievement. The view from the pass is truly spectacular. 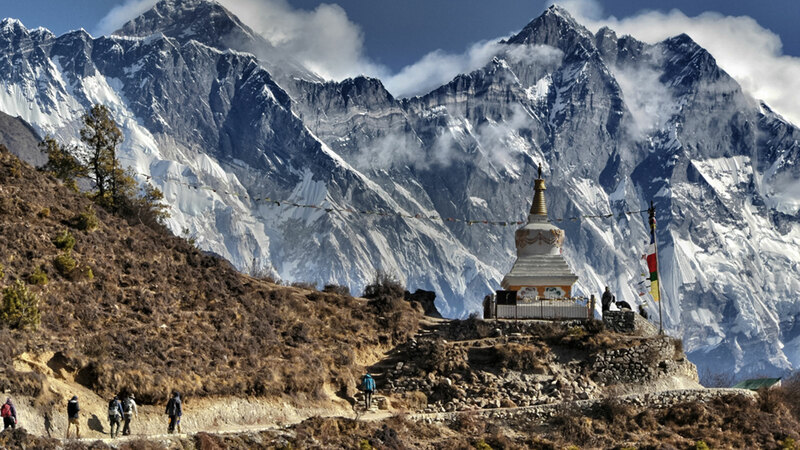 It spreads from the northwest wind eroded “Once Forbidden Kingdom” of Mustang valley to incredible mountain ranges of Annapurna and Dhaulagiri to the southwest. The pass was initially used as a trade route, herding agricultural products on yaks and donkeys. People of Mustang identify themselves closer with Tibet and the Mustang region has actually been part of Tibet in past. Lastly, we also go to the peaceful lake city of Pokhara on our way back to Kathmandu to end the trip to Annapurna Circuit Trekking. Standard Hotel Accommodation in Kathmandu and Pokhara on a twin share bed- and- breakfast basis as per the itinerary. Full board meals while on Annapurna circuit trekking. Responsible trekking of 0ne trekker : one porter. Accommodation in comfortable lodge or Teahouse on Annapurna circuit trek. Trekking guides and other support staff on entire around Annapurna circuit hiking. Warm clothing and other required trekking gear for porters like Gortex jacket /trousers, trekking shoes, woolen hat, woolen gloves, woolen shocks, sun glasses etc. Mountain Monarch T-shirts / other seasonal gifts. 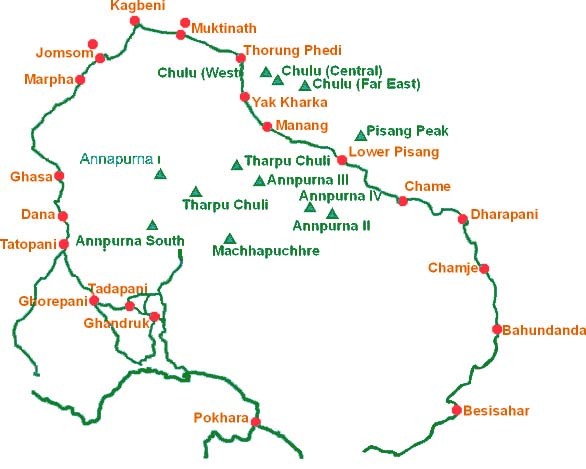 Annapurna circuit Trekking permit, Annapurna conservation entry fees. Tea houses in Annapurna Circuit trail provides you with hygienic family oriented lodges with twin bed sharing rooms with clean common toilets and occasional rooms with attach toilet bathrooms. Since advance booking is not possible sometimes these tea houses during peak season provides you with dormitory facility or dining hall with heated chimney. However, we have always given our best to accommodate our group in rooms available. You have variety of choices for the food and in Annapurna circuit tea houses cooks are proficient in preparing the variety that is in their menu. So far there has not been any complaints whatsoever in regards to food and accommodation provided by us. Annapurna circuit trek which once used to be the world’s no. 1 trekking destination during departed years and which once served as a fundamental trading route between Nepal and Tibet is by far the most admired and beautiful trekking destination of all. 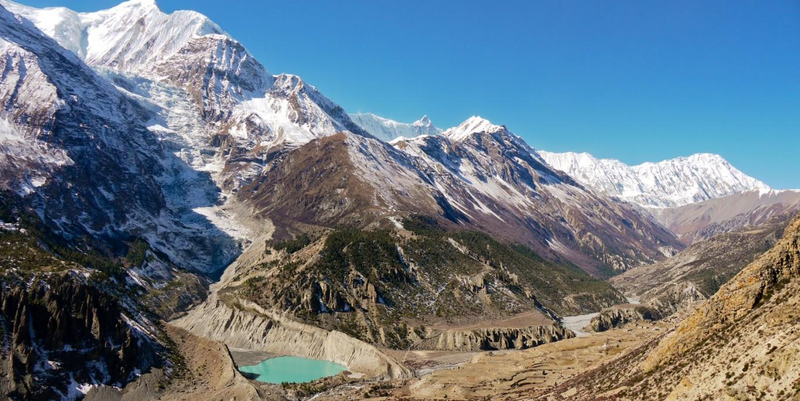 Annapurna circuit is challenging, though the trek rises to an altitude of 5416m / 17,769 feet but the daily altitude gain is very gradual which prepares undemanding grounds for going over the highest Thorong La pass. Anyone with reasonable fitness can join because altitude is the major issue than the level of fitness. However our itinerary is very well designed with slow pacing and ample time for acclimatization strategy. It’s indeed a heaven for keen walkers. April to mid June during spring and September to November during autumn before the harsh winter is the best time to trek to Annapurna Circuit when the view of Annapurna massif, beautiful gorges and startling landscapes are at its best state. Keen walkers from around the world come to visit Annapurna Circuit during winter (December till February) despite the serious chill factor and lower temperature since the day time in winters offers crystal clear weather and exceptional mountain views. However, there might be chances of closure of Thorong La pass due to snow fall. As the climate change has basically altered the pattern of weather factor winter trekking is doable if there is no heavy snow, all you need to do is prepare for the worst of chill weather circumstance. Annapurna circuit which is approximately 248km/154miles in total length comprises of four different constituency of Nepal namely – Lamjung, Manang, Mustang and Myagdi that goes through Beshisahar, Thorong La, Jomsom, Poonhill and Pokhara. The everyday shifting transformation in the vegetation and landscape is mystifyingly very touching. Morning half day city tour in World Heritage sites like Boudhanath Stupa, Pashupatinath, Swoyambunath (a monkey temple). Distribution of your kit bag, down jacket, sleeping bag etc. Today we cross Musi Khola Hydro power and climb to the village of Bahundanda (1311m). Descend down valley to lunch at Syange (1136m). Afternoon the track follows near-vertical cliffs high above the river camp at Jagat (1341m), a Tibetan village that served as a customs post on the long-standing trading route from Tibet. We follow classic route narrower and steeper. Walk passes several high waterfalls and suspension bridges. Lunch at beautiful village Tal by the Marchyangdi River with cool bridge of near by waterfall. Reentry permits at Police check post before the camp. Chame Town is administrative center of Manang District. Today, very refreshing day walk through forest and numerous tea-houses along the way. Come across excellent views of Lamjung Himal, Annapurna II (7937M), and Annapurna III (7555m) up the valley and to the west Manaslu and Peak 29 soar magnificently to the skies. Trekking permit be checked at police post at Koto, a short distance from before Chame (2685m). Pisang (3475m) Walk approx. 5 hrs. A trail now leads though fields of barley and buckwheat, to reach the apple orchards at Brathang (2840m), a formal Khampa (Tibetan rebels) settlement. After crossing the river into thick fir forest where you will have glimpse of Lamjung and Annapurna towering high above the trail. The forest ends and reach a clearing to reveal the huge rock slabs of Paungda Danda. We continue to follow the valley to reach the flat roofed with stone houses of Pisang village (3300m) and our lodge in full view of Annapurna II and Pisang Peak (6092m). Today, we walk through Pisang village and cross the River Marsyangdi to detour main road. Adorable views an indication of the arid trans-Himalayan terrain. We pass some terraced farmlands grow seasonal crops barley, wheat, buckwheat or potatoes can be grown. To supplement their living many locals run hotels and tea-houses as well as having herds of goats and yaks that graze on the hillsides high above the valley. Afternoon walking is fairly easy along the valley to Braga (3475m) where the houses are stacked on top of each other perched high on the valley cliffs. Monastery of Braga, the oldest and most interesting in the area, estimated to be above 500 years old. From the village of Braga it is only a short walk to the village of Manang. On 9th Day, Manang (3535m) acclimatization and exploration. Off day is designed to aid acclimatization not to relax hike above and around village where you will be rewarded with great views of the Mountains and valley. Manang is a tight compact village of about 500 flat roofed houses set among spectacular scenery. The huge icefall of Annapurna rears over the village. Annapurna II and IV (7525m) tower dramatically above the valley floor to the southeast, with Tilicho (7132m), Roc Noir (7485m) and the Grand Barrier to the west. Chulu West (6630m) and East (6200m) lay behind the village a hauntingly beautiful panorama. Today is a relax walking day, taken at a slow pace to avoid for the effects of altitude. We will leave in the morning and slowly ascend to village Tengi then away from Marsyangdi Valley. We pass Teashops and yak pastures before stopping at the pleasant meadow of Ledar (4200m). Trek to Thorong high camp (4700 m) 3 -4 hrs . The walk leads along a small glacial stream past the herders’ shades, towards yak pastures, which leads to a left side of River valley and good spot to establish the Thorong La Base Camp at 4100m/ after 3-4 hrs. We continue upwards after lunch to High Camp for night stay. Thorong La pass (5416m) Muktinath (3700m) Walk approx. 7 – 9 hrs. The pass poses no technical problems though need to start early morning, lately by 5 AM, so you can proceed slowly and safely. The trail is not steep but long, gradual approach passes several false summits before reaching some stone cairns making the crest of the pass at 5416 m. in fine conditions the views from the pass are truly fantastic. Spread out entire Annapurna range to the south, the Mukut and Mustang himal to the west, and the incredibly Kali Gandaki valley below. Peaks of Chulu west and east lie to the north, and on either side of the pass are Thorungtse (6462m) to the north and snow dome of Thorung peak (6484m) to the south. The steep descend from the pass is guaranteed to make the knees wobble, but you are compensated with the view of mighty Dhaulagiri (8167m) and Tukche peak (6920m). You will arrive at the first village on the other side of the pass, Muktinath, in the late afternoon. Today we trek to Jomsom with historical visit to Kagbeni, the gate of Upper Mustang. Kagbeni is situated at the junction of the Jhong Khola and the Kali Gandaki, and gateway to Upper Mustang. It is a fascinating village with many Tibetan influences. We passes medieval village of Jharkot, Shakya Monastery, a traditional medicine center and incredibly photogenic whitewashed houses and streets. The scenery is truly wonderful – soft light, patchworks of fields, peaks overhead, villagers out plowing the fields, horses tethered next to the houses, apple trees providing texture to the landscape. Down the Kali Gandaki riverbed, looking for saligrams along the way, to Jomsom, the administrative center for the region. We take an morning flight from Jomsom to Pokhara – a fantastic way to round off the trek, flying right along the Kali Gandaki Gorge between the Annapurna and Dhaulagiri ranges. Almost a day to explore lake city Pokhara, Over night stay at Hotel. This morning, we have a drive from Pokhara to Kathmandu. It is a thrilling/ exciting drive on High way through paddy fields and villages/towns with the Himalayas at the background. The remainder of the day is at leisure. Transfer to Tribhuvan International Airport with exhilarating experiences of Nepal in your mind.